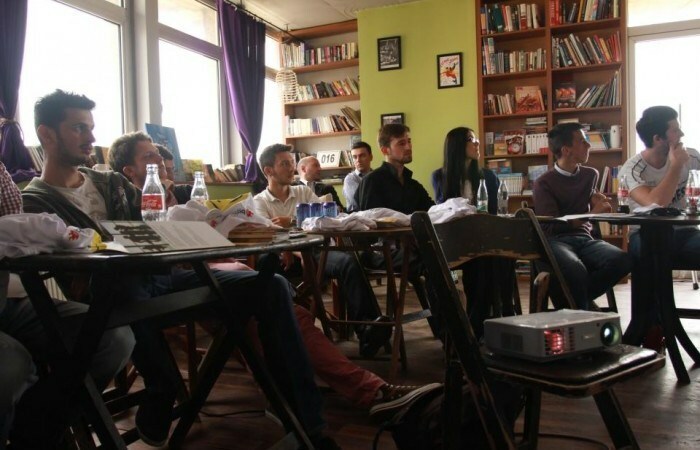 In May 2012, BarCamp hit the road with an event in Mitrovica. For more than two hours the Creative Corner was an arena for discussion and debate between participants and guest speakers. Around 20 people participated in the event, most of them either studied in Prishtina at FSHMN (the IT faculty) or just graduated from gymnasium in Mitrovica. All participants were very eager to learn and discuss BarCamp, the potential startup scene, and how to get in touch with other groups. Speakers for this event were Çelik Nimani from Innovation Center Kosovo, Taulant Ramabaja and Gent Thaci, organizers of BarCamp Prishtina. Speaking for ICK, Celik Nimani brought to BarCamp Mitrovica his experience in supporting Startups in Kosovo and the opportunities available at ICK to help others start new businesses. Nimani presented the projects which are implemented by ICK in order to facilitate a successful start for a greater business. • Taulant Ramabaja & Gent Thaqi- BarCamp: What’s all about? As activists with several years experience in the organization of events such as BarCamp, Ramabaja and Thaqi talked about all the necessary techniques for the successful realization of such events. They brought enthusiasm while talking for their experiences, difficulties and benefits that they had from the work they have done for several years. The event ended with an open group discussion in which all participants shared all the different ways in which they could get connected to what is happening in Prishtina. This included BarCamps (for their community building skills and CV), IF scholarships, which universities might be of greater interest to them regarding special scholarships, ICK/SWP, and FLOSSK.